A wave cable knit pattern consists of a panel of 12 stitches (the wave cable itself is 6 stitches wide). This cable gets its appearance from crossing inconsistently — to the right on one turning row and to the left on the next turning row. Cast on 12 stitches (sts). Rows 1, 3, 7, and 9 (RS): P3, k6, p3. Rows 2, 4, 6, 8, 10, and 12: K3, p6, k3. Row 5: P3, sl next 3 sts to cn and hold in back, k3, k3 from cn, p3. Row 11: P3, sl next 3 to cn and hold in front, k3, k3 from cn, p3. The combination of knit panels with purl panels (think ribs) and crossing stitches over stitches causes cable patterns to pull in widthwise. 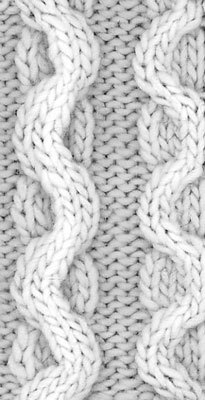 A sweater worked in a cable pattern will be significantly narrower than one worked using the same number of stitches in stockinette stitch. You need more yarn and more stitches for a cable sweater than for one of the same dimensions in a knit/purl pattern. If you decide to add a cable (or several) to a plain sweater, be sure to increase enough stitches after you knit your border in order to maintain the overall width. Although there are no hard and fast rules, you’ll be safe if you add 1 to 2 extra stitches for every 4 stitches in your cable. If you have a ribbed border, you can add the stitches evenly on the last ribbed row.